Scottish immigrants helped settle Grey County and we remember their efforts when we celebrate our Scottish heritage each year. Our band has helped keep this tradition alive by playing music in local parades and events over the past 57 years. To celebrate our Scottish roots, our Band will be hosting a Tartan Day Celebration on April 1st 2017 at the Beaver Valley Community Centre in Thornbury and welcome all to enjoy an entertaining night together. Social hour begins at 5:00 with a cash bar provided by the Thornbury/Clarksburg Rotary Club. Dinner will begin at 6PM with the “Ode to the Haggis” followed by traditional food: Scottish meat pies, neeps, tatties and of course Haggis! There will be music throughout the evening. Special guests include Jennifer Potter, Highland Dancers, and Highland Country Dancers. A number of new sets will be performed by the Beaver Valley Pipes and Drums. Tickets are $25 each and are available for sale until March 21st at the Pharmasave in Thornbury, at the Stuff to Read/The Source in Meaford, or from band members. Also tickets can be purchased by contacting our band at beavervalleypipeband@gmail.com. We hope you will join us on April 1st for our celebration. We are so excited to have Cheryl Toy of Little Church Knits join us for our Fall Workshop here at Grey Heron's new location in the bay side city of Belleville. Cheryl is an passionate knitter, designer, podcaster and instructor. Each module has a brief description of the class and with Cheryl's flair for teaching, you will learn an abundance of techniques, skills and tips/tricks. Each module will have a break at the halfway point for refreshments. Who's tired of the cold winter winds and ready to knit a great Spring sweater? Well, I think many of us are ready for those tulips and crocuses to show up. Have you heard about Joji's Boxy sweater line up? These easy fit fun toknit sweaters have been designed in several styles and yarn weights. The Boxy was Joji's first design like this. It has a unique construction with interesting details and lots of easy knitting. 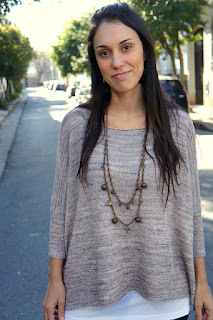 Boxy is a very simple modern sweater, with a very wide body and skinny sleeves. Worked with a lightweight yarn it is very flattering, drapey and stylish! A little short row section in the shoulders adds an interesting texture to the sleeves. Directions are given to make a seamless version (worked in the round) or a seamed version (worked back and forth) of the body. The sleeves and the neckband are worked seamlessly in the round in both versions. As per Joji's description. It's going to be really cold tomorrow so I thought I'd get a pair of soft squishy mittens on the needles. I love garter stitch - springy soft thick so here's a few patterns for you to check out on Ravelry. Have fun choosing which style you like.